Musgo Real - Classic Scent (After Shave) is a popular perfume by Claus Porto for men. The release year is unknown. The scent is spicy-green. It is still in production. Due to a nice barter deal I now own this classic of the cult brand from Portugal (Thanks to Parfumo InGENIEur). As far as I know, the company only produces articles related to shaving. Since I have been doing this again regularly since the end of 2017, products in this direction are always very welcome. The manufacturing process is described as quite elaborate with much manual work. For example, the soaps are dried in the sun for three weeks and not with the help of machines, which improves the consistency of the product. The ingredients of the soaps are also of natural origin. Whether this is so with the After Shave with the Ingredenzien musk or Amber then, is beyond my knowledge and/or can be doubted. The smell of this After Shaves is not so easy to describe, because the ingredients are well interwoven. Individual notes can hardly be emphasized in this way. I couldn't smell vanilla and tonka now (which doesn't bother me at all, they don't necessarily belong to my favos). Overall, I would describe the fragrance as rather old-fashioned and slightly oriental, but without greater opulence or pushiness. Despite its old-fashioned orientation - after all, it has been on the market since 1920 - it is portable for everyone. One could also call it timeless, which I like better conceptually. Conclusion: Musgo Real is certainly not something for every day. On the one hand because the fragrance is relatively strong or persistent and therefore not necessarily suitable for every EdT. On the other hand, I sometimes want a little more refreshment. Nevertheless, from a "nursing" point of view there is almost nothing better. I also like the classic but timeless smell very much. I'm always looking for quality and real handwork is also worth supporting, so I'll definitely test the shaving cream or soap. 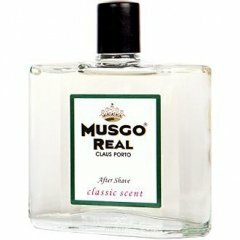 Write the first Review for Musgo Real - Classic Scent (After Shave)!